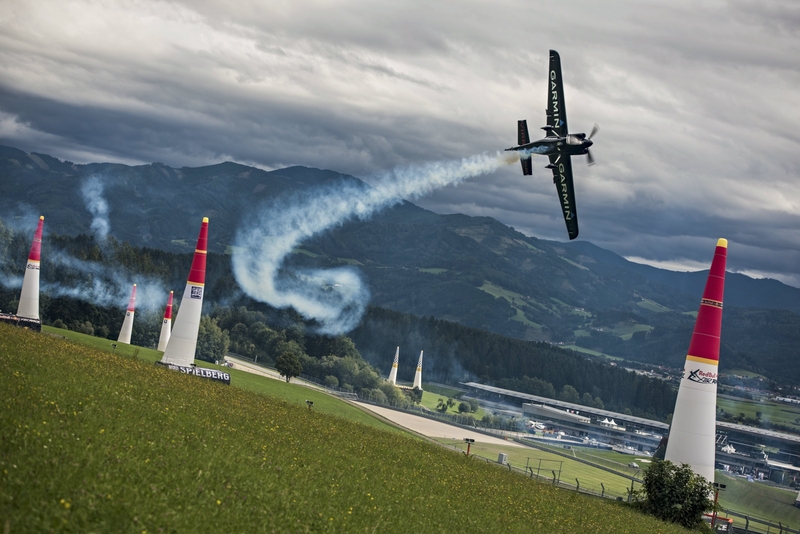 Pete McLeod had been impressing onlookers all week with his aggressive lines that dared closer than any other pilot to the mountainside trees at Austria’s Red Bull Ring. The Canadian’s brilliance continued in the opening round, where he delivered the fastest time of all 14 contenders and knocked out France’s Nicolas Ivanoff, the 2014 Spielberg winner, in a head-to-head battle. In the Round of 8, McLeod managed to fly cleanly again despite the crosswinds; however, the cagey Chambliss – a two-time titleholder known for his mastery of difficult conditions – was just .654 seconds faster, ending McLeod’s hopes to advance. It was Chambliss’s first Final 4 of the season, and the podium finish he went on to grab was his first since 2010. Australia’s Matt Hall won the Red Bull Air Race World Championship race in the Austrian Alps with an emphatic victory, beating Britain’s Paul Bonhomme into second place in a dramatic final while American Kirby Chambliss got his first podium since 2010 in third. Hall’s heart-stopping win in front of 20,000 spectators gives him 50 world championship points and narrowed Bonhomme’s lead in the world’s fastest motorsport series to just five points. The 2015 Red Bull Air Race World Championship moves on to its final two stops in the United States, in Fort Worth, Texas on Sept. 26-27 and Las Vegas on Oct. 17-18. In the Red Bull Air Race, which is the official world championship of the Fédération Aéronautique Internationale (FAI), the world’s top pilots endure forces of up to 10G as they navigate as precisely as possible through a low-level slalom track marked by 25-metre high air-filled pylons.